With 12x totally bright 15-watt RGBAW+UV 6-in-1 LEDs, HotStik™ EXA fixtures give you the ability to create any rich, vibrant color you can possibly imagine, then you can even add ultraviolet light to the mix to give it an eerie hue. Maybe create a custom scene with some beautiful, slow color fades leading into full on UV, alternating with a few brilliant blasts of cool white strobe. 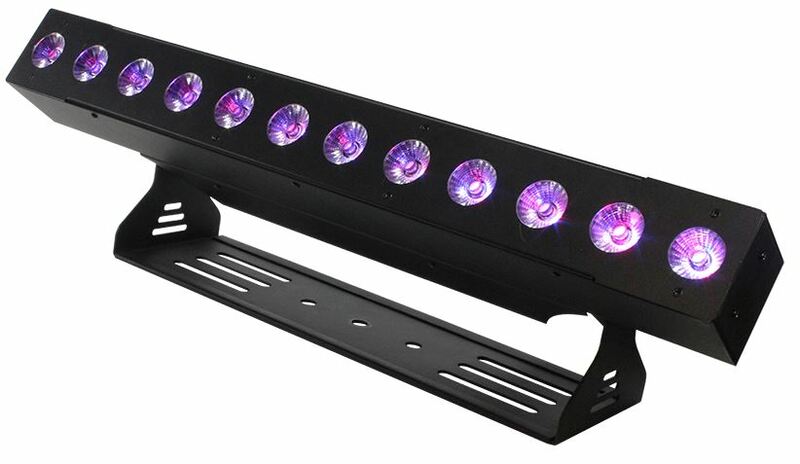 The possibilities are endless with 6-in-1 RGBAW+UV LEDs, they are truly amazing! With an awesome array of built-in color macros, automated programs, plus sound active mode via master/slave, the HotStik™ EXA is a perfect solution for any type of accent lighting. Plus, with the flexibility of either 3/6/8/10/11-channel DMX modes, makes the HotStik™ EXA a great choice for theatrical and production work as well. Whatever the need, the HotStik™ EXA delivers outstanding color reproduction in a smart, compact linear wash package! HotStik™ EXA fixtures offer a wide variety of DMX channel modes, which means they work great with any type of controller, and especially when in 6-channel mode; they are a perfect fit with our Kontrol 6™ and Kontrol 6 Skywire™ controllers that have six dedicated R/G/B/A/W/UV sliders. Then in extended mode, you’ll have full control of all the HotStik™ EXA has to offer such as RGBAW+UV color mixing, 35 built-in programs, ultra smooth flicker-free 32-bit dimming (5 user-selectable dimming curves), and even easy HSV color mixing ability in 3-channel mode. The super-easy to use built-in 4-button LED control panel also allows total control over the fixture including master/slave settings, sound active mode, built-in programs, auto mode, custom RGBAW+UV color mixing, and user adjustable fade/strobe effects for an unbelievable light show! This fixture also comes equipped with industry standard powerCON® compatible power input/output connections and 3-pin wiCICLE® enabled DMX input/output connections, which means the DMX jacks can directly supply power to our wiCICLE® wireless DMX system. An innovative design, that meaning even fewer cords and less setup time! And of course, it is also backed by Blizzard's 2-year warranty!